A $24,609.64 CFD Prepayment was receive from a Property Owner in Four Seasons Area 7B, but only $5,000 was submitted to the Bond Trustee. Around 2013 when Beaumont Property Owners started to question/complain about their Mello Roos CFD Taxes former City Manager Alan Kapanicas invented the perfect response: Prepayment. Beaumont Council and Staff began telling CFD Property Owners that they could save money and end their CFD ‘Debt Service’ Taxes by Prepaying their CFD Taxes instead of paying the debt over a 30-year period. The CFD ‘Services’ Tax is an additional tax Beaumont charges for 50 years and can not be paid off in advance. 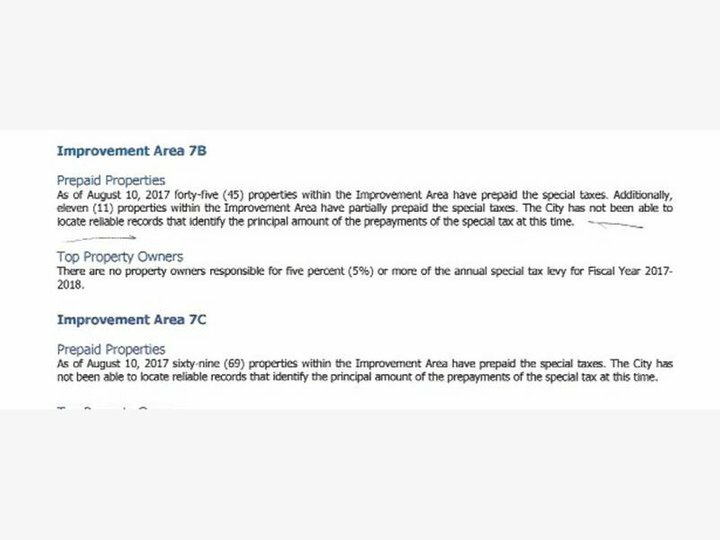 Many Property Owners have prepaid their CFD Taxes, but instead of the City sending the money to the Bond Trustee to pay on the Principal of the Bond the money disappeared. After the Raids Albert A. Webb & Associates took the place of Kapanicas and Urban Logic’s place in the City. Beaumont City Council gifted the title of ‘Special Tax Consultant’ to Webb & Associates. ‘Special Tax Consultant’ was a title Kapanicas made up for himself to funnel money from the bonds. On May 17, 2018 Beaumont City Clerks Donna Pfeiffer and Nichole Wheelwright verified that a $24,609.64 CFD Prepayment was receive from a Property Owner in Four Seasons Area 7B, but only $5,000 was submitted to the Bond Trustee to pay on the Bonds’ Principal. The 2012 C Bond Continuing Disclosures state that 45 Property Owners have fully paid their CFD Taxes and 11 have partially paid their Taxes, but the City stole the money instead submitting the money to the Bond Trustee. To this day the Beaumont City Council refuse to hire honest staff or to properly staff a finance department.